What’s the best type of filter for my pool? There are three types of filters for swimming pools: Sand filters are the best choice for a swimming pool. Of these, sand filters are the typically the best choice. Regular backwashing: Sand filters are simple to backwash and are backwashed usually once a week. This provides regular change-out of water. Pools with sand filters usually never need to be drained. Low maintenance: Sand filters are referred to as “permanent media” filters. In residential use, a sand change is rarely, if ever, required. Also, backwashing removes virtually all the dirt in the filter, so unlike the other filters, you start with a clean filter once a week. The only way to remove the accumulated dirt in this type of filter is to tear the filter apart and manually hose off the cartridge(s). The filter elements require replacement periodically. There is no way to backwash any water and therefore the pool water tends to accumulate excessive minerals over time. High maintenance: Backwashing does not remove all of the accumulated dirt. This filter requires annual tear down to physically clean the filter grids. Filter grids fail over time and require replacement. Rare backwash: These filters are only occasionally backwashed, so the pool water tends to accumulate excessive minerals. Filter additive required: After backwashing or cleaning, Diatomaceous Earth needs to be added in order to coat the grids. The Diatomaceous Earth forms a “filter cake” on the cloth grids in the filter. This Diatomaceous Earth is a fine white powder that remains on the ground wherever the filter is backwashed. This powder is considered a hazardous waste in some states. It should not be inhaled. What is a “Salt System,” how does it work, and is it a good idea for my pool? When we refer to salt systems or saltwater pools, we are usually talking about the recent practice of adding salt to the pool water and installing a device in the plumbing of the pool equipment that makes chlorine out of the salt in the water. The chlorine atom is a component of the salt molecule. The “salt system” is really a home chlorine generator. It makes chlorine by subjecting the salty pool water to high voltage as the water passes through a “cell” installed in the pool plumbing. The chlorine thus made is the same as what is sold as liquid pool chlorine – sodium hypochlorite. Some homeowners are under the impression that with a salt system, they now have a chlorine-free pool. This is false. They are simply manufacturing their own chlorine instead of buying it and adding it to the pool. Chlorine is chlorine, regardless of the source. Some homeowners like the way the water “feels” on their skin in a saltwater pool. This is the effect of the salt in the water; salt tends to soften the water. It has nothing to do with whether or not an expensive home chlorine generating system is installed. Simply adding salt to any swimming pool will give this “soft feel” to the water. The real question is whether the salt system saves money by generating chlorine for less than it would cost to purchase the equivalent chlorine. The answer is no. A salt system costs anywhere from $700 to $2000 to install. Regular pool maintenance is needed to clean the cell, which tends to build up calcium on the plates. Plus, the salt cell itself needs to be replaced periodically at a cost of hundreds of dollars. My pool tile has developed an unsightly deposit at the waterline – how do I clean it? Various manufacturers sell some extremely potent acid-based products for cleaning pool tile. However, none are completely effective for the waterline deposits here in the southwest. This is because much of the typical deposit consists of salts and other minerals that don’t readily dissolve in acid. There are also various abrasive scrubbing materials sold. One of the more popular is chunks of volcanic lava cut into rectangles. These are extremely abrasive and somewhat effective. However, they must be used with care as we have seen pool tile permanently scratched from the use of this product. I recommend having a professional tile cleaning service that uses a pressurized media to remove the buildup on the tile. It’s similar to sandblasting but instead of sharp-edged sand, they use round glass beads, walnut shells, salt, soda, or some other media. Should I “shock” my pool with chlorine? When and why? Chlorine is used to sanitize pools because it is relatively inexpensive, readily available, very effective, and it has the advantage of being a good algaecide. It kills harmful microbes, helps to prevent the plant algae, and oxidizes organic matter. However, in the process of this oxidation, chlorine tends to combine with ammonia and create chloramines. We call this combined chlorine, as opposed to free chlorine. Chloramines tend to irritate eyes, turn blonde hair green, and smell of chlorine excessively. Additionally, chloramines are slow to kill microbes and poor at preventing algae growth. Free chlorine has virtually no smell in pool water even at many times the normal level. Neither does it irritate eyes, etc. Unfortunately for pool owners, chloramines are very stable. Some municipal water systems use chloramines as their sanitizer because of their stability – it will remain active in the water throughout its travel through the pipes, and the length of time it takes to kill microbes is not an issue. We shock pools to get rid of chloramines. At above eight parts per million (8ppm), chlorine will break the ammonia bond and oxidize the ammonia, leaving only free chlorine. So when we “shock” a pool, we must be sure to add enough chlorine to reach 8ppm or above. This is also called breakpoint chlorination – the breakpoint being 8ppm. There are tests that check total chlorine as well as free chlorine. If the reading is different, the difference is combined chlorine. As homeowners, you can test for chloramines and shock if they are found. 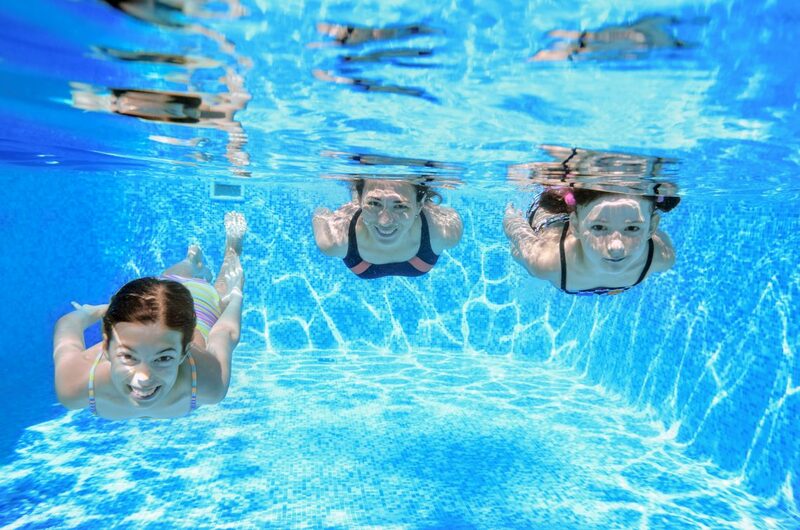 We can also shock a pool after it gets heavy use, after a dust storm, or before the swimming season begins, as it’s a safe bet that chloramines are present at each of these times. We proudly serve the entire Phoenix Metro area, including Anthem, Avondale, Carefree, Cave Creek, Chandler, Glendale, Goodyear, Paradise Valley, Peoria, Phoenix, Scottsdale, and Tempe. Thank You for choosing 360 Pool Services. We provide quality pool cleaning, swimming pool repairs and maintenance, emergency pool service, and swimming pool filter maintenance for Phoenix and Scottsdale residential and commercial properties. For a Free Quote Call (480) 900-Pool (7665) Today!! !